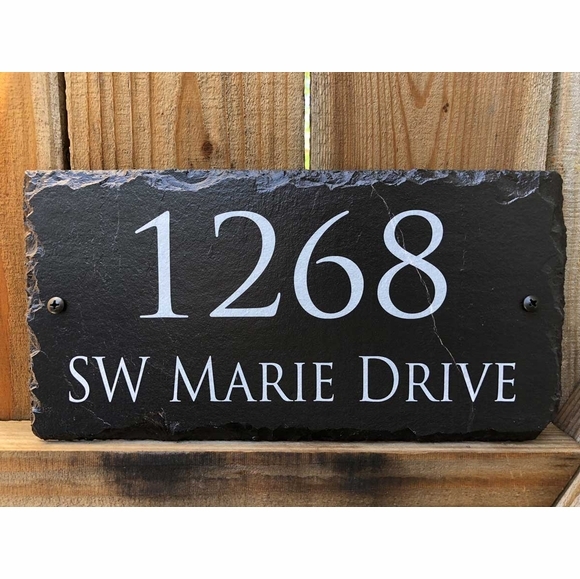 Slate Home Address Sign White on Black - - made in USA. Made from hand-cut, fine-grained slate, this sign is perfect for placing on your porch, at the bottom of the driveway, or hanging from your house or garage. Two font styles: all caps or script. Two line sign holds up to four (4) characters on Line 1 and up to nineteen (19) characters on Line 2. Two mounting options: wall mount or hanging. Please select the hole location you prefer in the drop-down box above. Includes all hardware. Colors: black with white wording. Address number in large image above: 1268 SW MARIE DRIVE.